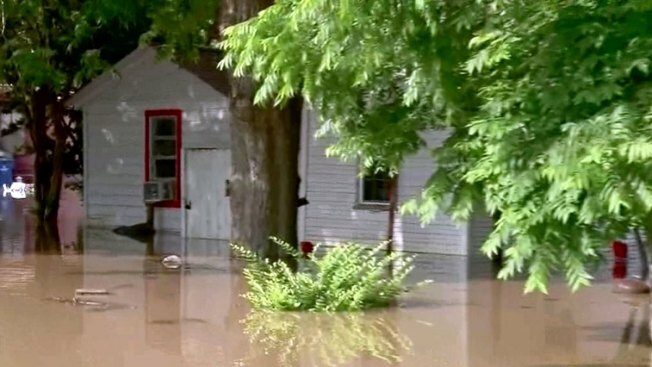 Residents of some rural southeastern Texas counties were bracing for more flooding along a river that reached a record high Tuesday as more rain was expected in the coming days. Large swaths of suburban communities southwest of Houston were underwater and hundreds of people were evacuated from their homes before the Brazos River reached 54.37 feet in Fort Bend County, just two years after it had run dry in places because of drought. National Weather Service meteorologist Charles Roeseler said the 54.37 feet at Richmond early Wednesday was not yet the crest and the river was expected to slowly rise even more overnight. An additional 1 to 3 inches of rain expected later this week could keep the Brazos in major flood stage into the weekend. During four days of torrential rain last week, at least six people died in floods in Texas. Scott Overpeck, a National Weather Service meteorologist, said that the Brazos will recede in the coming days but that its levels will remain high for up to three weeks, in part because water will need to be released from swollen reservoirs upriver. Heavy rains moved across the Dallas-Fort Worth area on Tuesday. In Hood County, southwest of Fort Worth, several roads were washed out and authorities performed about 15 water rescues, including from homes and vehicles, said Sheriff Roger Deeds. He says they were still trying to determine how many homes flooded. Associated Press writer Jim Suhr in Kansas City, Missouri, contributed to this report. This story has been corrected to reflect that it's not clear whether the six people who died in flooding were killed along the Brazos and that the 54.37 measure on the Brazos was taken early Wednesday.